The MOBILE MONDAYS crew have another very special guest spinning 45s with them at their weekly night of funky vinyl shenanigans. It cannot be easy trying to follow some of their previous guest DJs; names like LORD FINESSE, BREAKBEAT LOU, DJ SPINNA, DANNY DAN THE BEAT MANN, MAC MCRAW, FORREST GETEMGUMP, J-ZONE, EPMD's own DJ SCRATCH and other Hip Hop icons have all blessed the turntable at a MOBILE MONDAYS event. 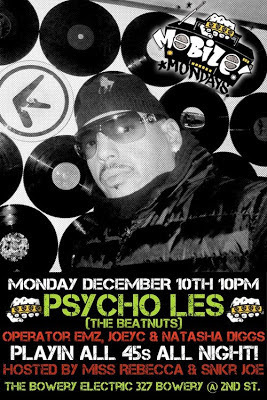 But somehow the MM crew have done it again with tonight's invited DJ, one half of Queens crew THE BEATNUTS ... namely PSYCHO LES. I'd like to give props to OPERATOR EMZ, SNEAKER JOE, NATASHA DIGGS, JOEY C and MISS REBECCA for putting on such a fine list of vinyl selectors over the last year. It goes without saying THE BEATNUTS have always been a favourite crew for us here at DAILY DIGGERS. 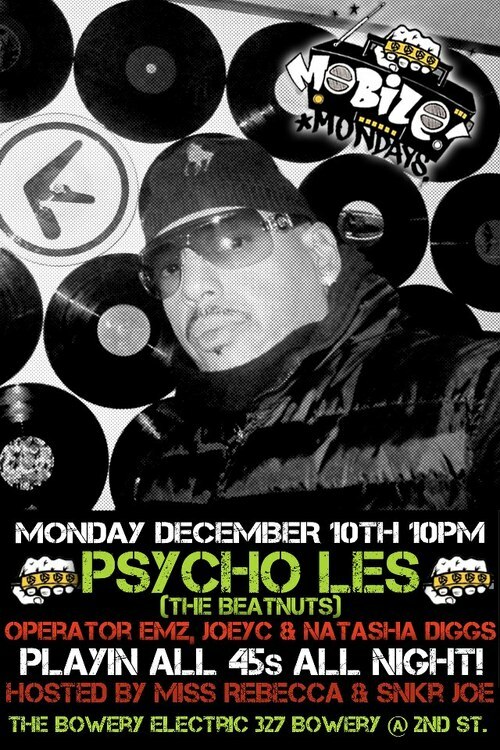 I can imagine PSYCHO LES will be dropping some ill funk records plus maybe a few classic 'NUTS samples. I wish I could be in NYC to witness the funk myself.